What was your first exposure to science fiction? Was it comic books? Paperbacks? My Favorite Martian? Star Wars? Star Trek? For todays children, their first exposure is probably through cartoons. Few science fiction cartoons existed when we were kids. What cartoons existed were aimed at very young children by cynical adults. Today, childrens science fiction cartoons are flourishing on the independent stations following the success of Batman the Animated Series and X Men. These new science fiction-themed cartoons are providing heavy science fiction for older kids, and original (if slightly mindless) science fiction for younger ones. Unknown to parents until last fall, the Mighty Morphin Power Rangers topped many childrens holiday lists. Panicked parents generated a demand for Power Rangers, calling distributors for the toys and shipping them at their own expense. Mighty Morphin' Power Rangers is a thirty-minute live-action show. Two-thirds of the footage is shot in America and the remaining third is imported from the original Japanese show. The premise: Rita Repulsa and her Evil Space Aliens are released from 10,000 years in intergalactic solitary confinement. Like most maniacal villains, Rita is obsessed with taking over Earth. Zordon, a holographic head and a good-guy, instructs his short robotic sidekick to recruit "teenagers with attitudes" to become Power Rangers capable of summoning dinosaur-like robots. Each of the teens was already proficient in martial arts when recruited. The five rangers are Jason: the Dragon Zord, Kimberly: the Fire Bird, Zack: the Lion, Trini: the Griffin, and Billy: the Unicorn. The show intertwines classic Japanese monsters and transforming robots with high school teenagers experiencing regular teenage television problems. Admittedly, when Pink Ranger Kims homecoming float is trashed by a thirty-foot bipedal toad that spits out carnivorous flowers, that might not be average. But after her friends save the earth, its a scene worthy of Saved By the Bell. Actually Saved By the Bell never portrayed teenage group friendship as well as Power Rangers does  which is one of the things that makes this a great series. The toy series from Bandai America includes action figures and monsters and the transforming "zords" featured in the show. To get the full range of transforming capabilities, you need all five Power Rangers figures so that the parts can "morph" together. The zord interlock to recreate the ultra zords and megazords from the series. If theres a kid under twelve in your life, you might want to consider Power Rangers for birthday presents. Of course, first make sure they watch the show. Bandai will be expanding The Mighty Morphin' Power Rangers toy line through the year. Next up for the younger set is Biker Mice From Mars. In spite of myself, I like this series. My husband and daughter watch it every Sunday. The premise: Plutarkians have destroyed Mars by buying up all the land and strip-mining it of resources. Only three bikers, who happen to be large mice with antennae and lifetime memberships at Golds Gym, survive. The Mice: Vinnie (the vain one), Throttle (the leader) and Modo (the big one with the attitude) crashland into the scoreboard of Wrigley field and discover signs of Plutarkian devastation in Chicago. The Biker Mice frequent Chicago's Last Chance Garage, run by a female mechanic named Charley. Charley is more active than the Turtles' April ONeil and has more character, too. What she doesnt have is a bike of her own. She just fixes them. Though willing to aid in the fight, the Biker Mice won't let her. After Vinnie unceremoniously dumps her from the back of his bike and takes the gun out of her hand, Charley demands to know why she cant defend her planet. Vinnie shouts back, "Its stupid macho stuff, remember?" and leaves her in the bushes. This show is incredibly tongue-in-cheek. 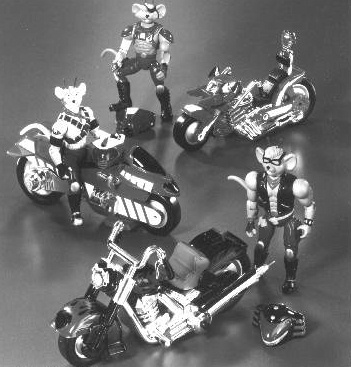 Biker Mice action toys are put out by Galoob. Be warned, the Mice only playtested well with children up to the age of ten. If youre purchasing these as a gift, buy both a bike and a mouse. The action figures by themselves dont seem to lead to extended play. With the bikes, however, the situation play can last about an hour. I should point out that I caught a couple of men over thirty displaying great interest in the bikes. Mice cost about six dollars, bikes range from ten to thirteen dollars. All action figures come with a weapon. Later this year Galoob will release several playsets including the Biker Mice Scoreboard hideout and Dr. Karbunckles Transporter and Secret lab. These should greatly enhance the playability of the Biker Mice Action Figures. This show might be a little too light-headed for adults to watch with the kids, but it does have a cynical sense of humor that could keep you entertained if you have to watch. Exosquad is a kids show that adults can enjoy. If it were an adult science fiction series, it would probably cost two million per episode. The show takes a standard science fiction action plot and does some amazing things for a half-hour animated series. This is a continuing series. Each week is the next chapter in the saga, complete with old-fashioned cliff hangers. The premise: Using E-frames to terraform Venus and Mars, human beings are ready to expand into the galaxy. But a genetically engineered race of Neo Sapiens turns against its creators, conquering and enslaving mankind. A surviving fragment of the interplanetary army, the Exosquad, tries to overthrow the conquerors. Though using a tired and trite science fiction concept, Exosquad showed more character development and interpersonal interplay in its first three episodes than in an entire season of most adult series. This was done without sacrificing the action needed to keep the interest of kids weaned on MTV. If good writing and realistic dialogue aren't enough, the mechanics stay within the realm of real science fiction. People inside their E-frames control the large robotics bodies by cyberjack connections reminiscent of Tek Wars. Combine this with intricately detailed action toys and figures from Playmates, and you have a fantastic product. We playtested the J.T. Marsh action figure with Aerial Attack E-Frame and Marsals with Rapid Assault Light Attack E-Frame. They playtested well with all age groups. The Rapid Assault E-Frame comes with insertable cyberjacks, light-up retro-bow lasers, and sound effects. It also comes with a spring-powered floating drone disk rocket launcher that fires real rockets -- wind it right and Ive seen it hit a nine-foot ceiling. All of the Exosquad line has this attention to detail. These toys really hold childrens interest. My daughter asks to play with them every morning. The toys even drew interest from kids who had never seen the show. The only drawback is that some of the stickers are numbered incorrectly. You can develop a headache trying to get them on properly. I figure this can be solved by forcing the toy designer to try to apply the stickers by himself. If you hold on to the box for reference and are aware of the problem beforehand, you shouldn't have too much trouble. Due to deadlines, I had to playtest the Exosquad line with two thirteen-year-old boys. Anybody who thinks that these youngsters are still young enough for toys, should reconsider. Both of these boys read Collectible Toys value listings regularly; they price comic collectibles better than most adult investors. They have only bought action figures in the last two years for "investment." They save them unopened in their blister packs in order to preserve their value. After seeing The Exosquad toys, these boys planned to get some of the toys for themselves; one was going to see the show he had previously dismissed as something for his younger brother. This show you can watch with the kids. If the kids talk too much, throw them out of the room. You do not want to miss any of the plot. About Educational Toys and Collectables that are Fun to Play With! ABOUT COLLECTIBLE KIDS: The Collectible Kids column ran in Strange New Worlds in the early 1990s. It reviewed and recommended children's products that encourage imagination, creativity, a love of learning, a sense of history, and a belief in the future. Plus, any toys listed as "recommended-to-buy" should also be just plain fun to play with. Products were play-tested by actual children. Testing was performed with three different child groups: 1) Coed, ages four through eight, 2) Female, ages eight through fourteen, and 3) Male ages eight through fourteen. Depending upon the toy, a fourth group may be used: Coed, ages eight through fourteen. Following the play-testing, all toys were donated to charity. ABOUT ADRIENNE REYNOLS: Adrienne Reynolds is the creator and editor-in-chief of "Gateways Past, Future . . . Sideways," a quarterly magazine of character-based stories with a sense of the unexpected. A writing instructor, Ms. Reynolds ran the Fantek Writers group.